Google has been whining that the site is not mobile friendly, so I have been looking for “Responsive” WordPress themes that will work without incredible problems. The new one, called DW Minion, seems to do that, although it will need to be configured, which will be slow in the coming. The old posts definitely look bad, but since there are about 622 of them, I don’t intend to clean them all up. Otherwise, I am still reading disks for people, sending DOS disks to people, sorting through thousands of disk images, etc. I hope to have another set of eBay auctions soon. Eric Hacker has let me know that this week’s “Triangulation” show (#83) on TWiT Network featured an interview with Harry McCracken. Harry’s first computer was a TRS-80 and he has been very pro-TRS-80 in his reporting for PC World, Technologizer, and now Time Magazine. 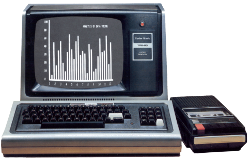 September 12, 2012 – TRS-80 on FPGA – Thoughts? Michael, a site visitor, has some experience with FPGA’s and is wondering if anyone out there in the Interwebs would be interested in building a new Model III or 4 (i.e., real Z-80, real RAM, fpga for glue logic, rom, serial port, video & keyboard, and a floppy disk emulator). Please sound off in the comments. 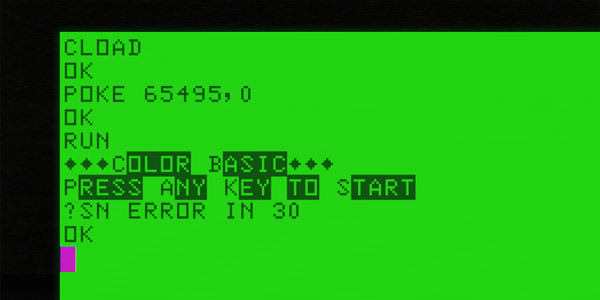 Ray Larabie has released the Color Computer font. Thanks to a combination of Adobe Acrobat’s built-in OCR (for what it is), QuickBasic/64 (how did I not know you existed?!?! ), and Textpad, I was able to have the computer determine whether RSC-17B had any catalog entries that were not yet added to the TRS-80 Catalog Search Page. The answer was a resounding yes, and the TRS-80 Catalog Search Page is now up to 2250 entries, all but 35 of which have the actual catalog entry present as an image. I am not sure I will continue adding Radio Shack entries, as we have long exhausted the Model I/III/4 entries, and I am not so interested in what the 6000 might have in store for the Xenix operating system. If I had a better scan of a Med Systems catalog I would do that as well, but I do not. Off to other projects I guess. Since I am trying to sort through the unsorted TRS-80 CP/M files I have, I have created a TRS-80 CP/M page. The project is somewhat of a bear because the ONLY way I have figured out how to get files ONTO a CP/M virtual disk, is to utilize a program called NWD80CPM written by Blandford Computers for the Genie III running under an emulated CP/M disk; and for some reason they require you to enter the CP/M Destination Disk, the NEWDOS/80 Source Disk, the NEWDOS/80 Filename (NO WILDCARDS, even though they are supported under CP/M), A yes/no as to whether you want to add line feeds to carriage returns, and then a yes/no that confirms that the disks are mounted … FOR EACH FILE. Should you run out of disk space at any point in this process, you must start over, as not exiting the program gracefully leaves a corrupted directory. It also will not process filenames which are illegal under NEWDOS/80 even if they are legal in CP/M. It will also error out if you attempt to copy a zero length file. The CATALOG NUMBER SEARCH PAGE and SOFTWARE ARCHIVE SEARCH PAGE continue to be updated, as do their underlying databases. In order to facilitate adding catalog numbers to the software archive, three new changes have been introduced … 1) Sorting can be done by catalog number (not a particularly useful feature) in the Software search and 2) You can search for all Radio Shack or Tandy software by entering TRS (capitals only) into the Author field of the software search (as some items were copyright Radio Shack and some Tandy; and neither search produced complete results independently), and 3) The catalog search page can limit results to Model I/III/4 only. What strikes me is how many Radio Shack software products have not been archived. Had no idea it was that many.